20 December 2017, at 6:00a.m. As global demand for protein puts increasing pressure on resources worldwide, broilers are emerging as a sector where sustainable mass-production is possible, writes Karen Christensen, Associate Professor, Center of Excellence for Poultry Science. The idea of sustainability in the poultry industry is important. Although there are many definitions, all being similar, one definition from the United States’ 1990 Farm Bill defines it as "an integrated system of plant and animal production practices having a site-specific application that will, over the long term: satisfy human food and fiber needs; enhance environmental quality and the natural resource base upon which the agricultural economy depends; make the most efficient use of nonrenewable resources and on-farm resources and integrate, where appropriate, natural biological cycles and controls; sustain the economic viability of farm operations; and, enhance the quality of life for farmers and society as a whole." I would add to this definition that animal welfare is an important part of sustainable agriculture. The broiler industry is well placed to continue to meet the definition of a “sustainable commodity”. The continued demand for an economical, high-quality protein has positioned the broiler industry to be a leader in efficient production and will lead the protein demand as the population increases over the next 30 years. Developing economies around the world will move to a diet that’s higher in animal protein and, due to the economies and sustainability of the broiler industry, demand will continue to increase. As recently as the 1930s chicken meat was a delicacy and not only expensive but not available as we know it today. Most chicken dinners were either old egg-laying hens at the end of their productive life or the males from the egg layers that were raised for what little meat they could produce. It was in the ’40s and ’50s that real progress got underway in the development of meat-type genetics. This effort was a response to consumers’ demands for quality chicken meat that would be available on a year-round basis and was economical. Previously, chicken dinners were more expensive than what we would consider prime cuts of beef today. Rapid advances in genetics, nutrition and technology have all played an important part in increasing the efficiency of broiler production and progress in housing and environment will certainly play an important role in the future of sustainable production. The improvements in growth and feed efficiencies over the past 50 years has seen individual bird weights nearly double, while feed conversion – a measure of efficient use of feedstuffs – has decreased by 17 percent. As progress in genetics, nutrition and housing continue, the reduction in resources is significant. Every two-point reduction in feed conversion – from a 1.87 to a 1.85, for example, based on current production numbers – the amount of corn required is reduced by the equivalent of 75,000 acres (based on the corn per acre produced in Iowa). In addition, the use of other resources including water, diesel and fertiliser is diminished. These improvements also reduce the number of rail cars of feed required at feed mills and the number of miles feed trucks have to travel to make their deliveries. This same reduction in feed efficiency equates to at least 16,000 fewer trips to deliver feed to broiler houses. The majority of broilers in the US are produced in a vertically integrated system which provides for nearly 42,000 broiler farms that are operated by family-owned farms. These farms currently raise, on average, nearly six flocks of broilers per year based on the final market weight. Because the growth rate has continued to improve, the number of houses needed to raise broilers is not increasing at a fast rate. Older houses must be replaced as they often no longer provide an environment for the broilers that meets welfare standards. New houses are also much more energy efficient with the incorporation of LED lighting and energy-efficient fans. The switch to LED lighting has accelerated since information about production with LED bulbs has proved that performance is at least equal to that of growth and efficiency under incandescent bulbs; switching to LED can result in energy savings of 80-85 percent compared to traditional incandescent bulbs. The modern poultry-house environment is mostly controlled by sophisticated controllers that make continuous changes in temperatures and ventilation to maintain optimum environmental conditions for the broilers while saving gas and electricity. Any significant change in growth rate will result in a demand for additional housing, an increase in manure production and an increase in water usage. Water is quickly becoming a scarce resource, as we have seen recently in agricultural areas of the US that have been hit by drought conditions. Water efficiently will become an increasingly important production parameter in years to come. Since the days to market have been reduced in the last 50 years, on average from 56 days to 47 days, the amount of water used per bird is lower just due to the fewer days each one spends in the house. Although water consumption increases with the age of the broiler, the amount of water consumed per pound of body weight decreases. 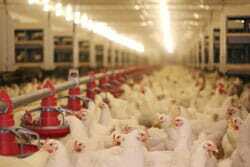 There is a renewed interest in food production, particularly in how food animals are produced. As a result we are seeing new production schemes being developed or old ones from previous times being brought back. Pastured poultry, birds with organic, outdoor access and slower-growing or heritage breeds are being raised in greater numbers for a new market. These choices for consumers are more widely available but none fits the definition of “sustainable”, as they add to the use of resources such as land (for feed production and housing), water and energy consumption. The industry is working to improve the modern broiler but this bird is well designed to be a part of the “sustainable” food supply, especially as world demand for animal protein increases and greater protection is required for the resources needed resources to produce them.